«Building stars, planets and the ingredients for life in space» is the title of a public lecture by the renowned Dutch astronomer Ewine van Dishoeck on 20 October 2017 at the University of Bern. «Ewine van Dishoeck is one of the pioneers in astrochemistry and a driving force behind the groundbreaking ALMA observatory,» says Kevin Heng, Director of the Center for Space and Habitability (CSH) of the University of Bern, who invited the Professor of Molecular Astrophysics at Leiden Observatory for the CSH Distinguished Lecture 2017. ALMA stands for Atacama Large Millimeter/submillimeter Array, the worldwide biggest radio telescope composed of 66 antennas on a desert plateau at 5000 metres altitude in Chile. The array allows to zoom in on planetary construction zones in the cold and tenuous clouds between the stars in the Milky Way. Water and a surprisingly rich variety of organic materials are found, including simple sugars. In her lecture, Ewine von Dishoeck will address questions like: How do stars and planets form? Why are some exoplanets so different from the planets in our own solar system? Which ingredients are available to build them? Can the pre-biotic molecules end up on new planets and form the basis for life elsewhere in the universe? 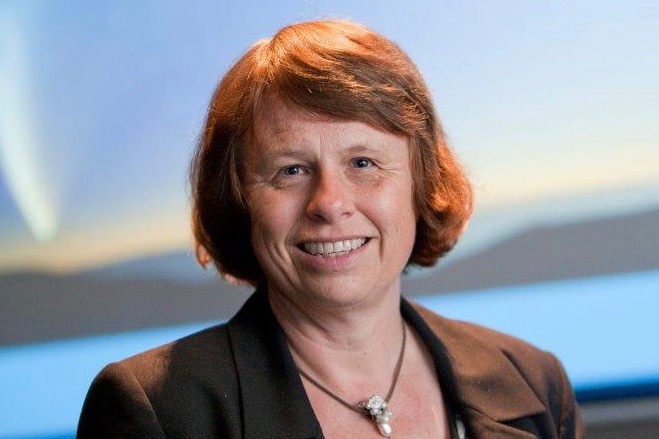 Ewine van Dishoeck is one of the most widely-cited astrophysicist in the world. Among the many prizes she won is the Albert Einstein World Award of Science 2015. She is President-elect of the International Astronomical Union (IAU) with more than 12’000 members. PlanetS benefits from her experience as she is a member of the international review panel of the NCCR.